If you have not tried Spanakopita before, you’re in for a treat! 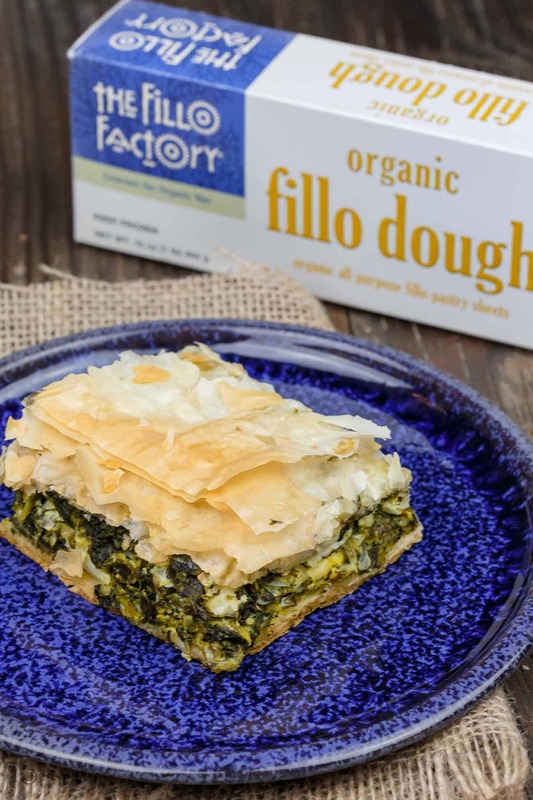 Spanakopita is a delicious savory Greek pie made of perfectly crispy layers of phyllo dough and a comforting filling of spinach and feta cheese. I’m sharing my family’s favorite spanakopita recipe, complete with tips, video, and step-by-step photos. 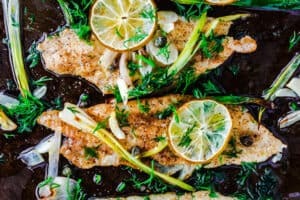 Trust me, this is so much easier to make than you think! Spanakopita makes a great side dish for large holiday dinners next to lamb or lemon chicken. But it can easily stand alone as the main dish. Serve it with a big salad like Greek salad; Balela; or this Mediterranean chickpea salad, and favorite dips like Greek Tzatziki or Roasted Garlic Hummus. This post is sponsored by The Fillo Factory. 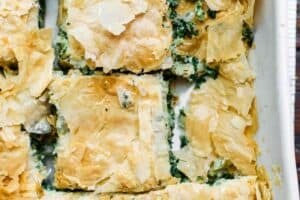 Spanakopita is a popular Greek savory pie made of perfectly flaky phyllo dough with a comforting filling of spinach and feta cheese nestled in. If you’re not familiar with phyllo dough, it is basically layered sheets of tissue-thin pastry dough, typically found in the freezer section next to things like pie crust and puff pastry. Spanakopita can be made in a large casserole dish like in today’s recipe, or in the form of hand pies shaped in triangles or even rolls. 1. What is in the spanakopita filling? 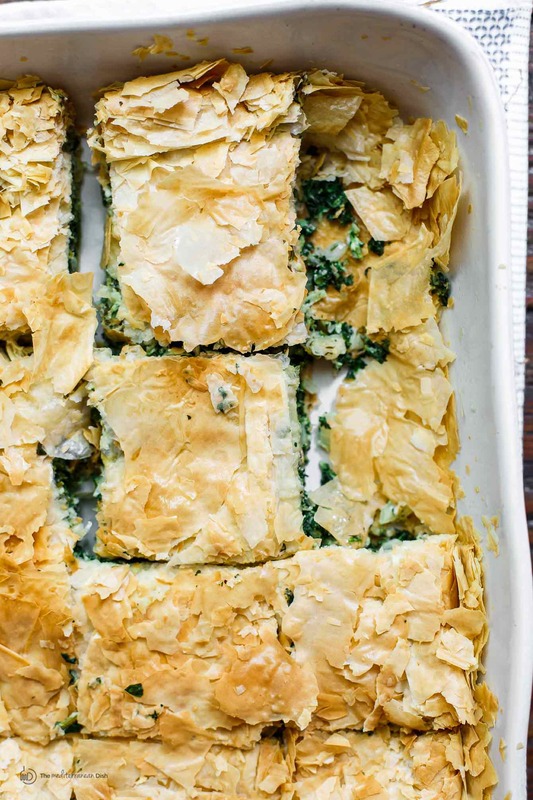 The key filling ingredients in a classic spanakopita recipe are spinach and feta cheese. And yes, only use quality feta cheese, no other cheese qualifies for spanakopita. 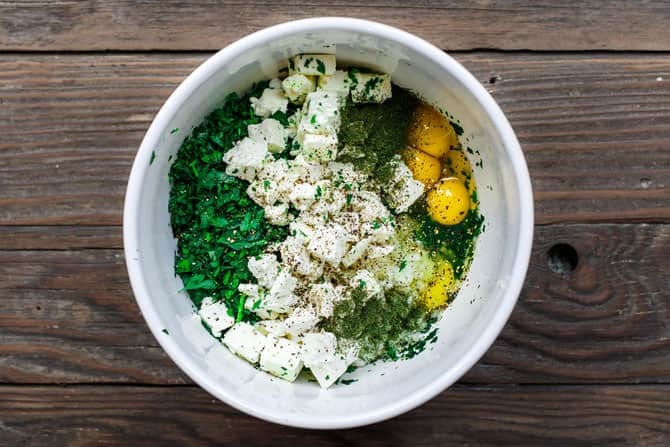 To the spinach and feta, we add flavor makers in the form of fresh herbs and aromatics. I used two whole bunches of parsley (parsley stems pack a ton of flavor, by the way, so don’t be afraid to throw some in) Then, onions, garlic and a little dry dill weed. To bind everything together, I used four large eggs. 2. 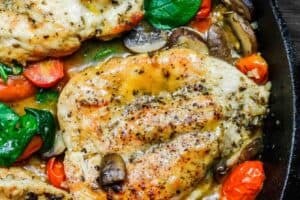 Do I need to cook the spinach in advance? 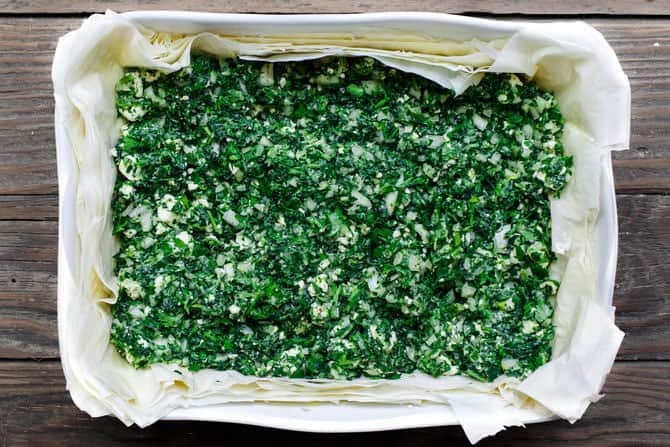 You need a good amount of spinach in this recipe, so using frozen spinach is the way to go. 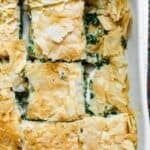 In this easy spanakopita recipe, frozen spinach–fully thawed, of course–is mixed right in with the remaining filling ingredients, no advanced cooking necessary. But one thing you must do, be sure to drain all liquid from the thawed spinach. I ended up squeezing the spinach by hand a few times until it could no longer produce any liquid. 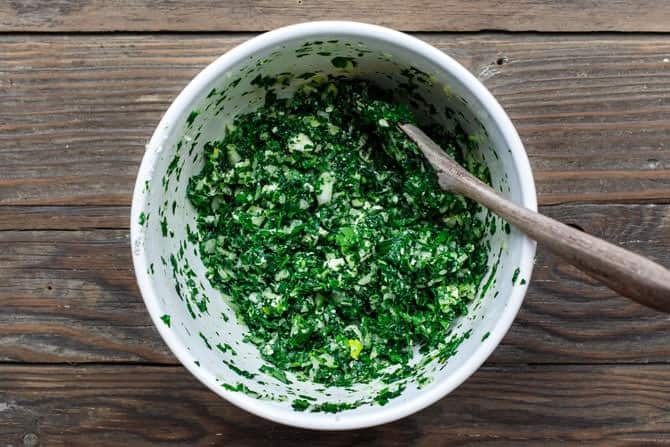 If you do use fresh spinach, you will need to cook it with the onions and garlic, drain, and let cool completely before mixing the filling. Golden, crispy phyllo pastry, encasing the soft spinach filling is really what spanakopita is all about! Quality of phyllo (fillo) dough can make or break the recipe! I am a big fan of organic dough from The Fillo Factory. It’s vegan and contains no preservatives; no cholesterol; and no trans fat. And be sure follow the tips below for best results. – Thaw phyllo dough properly; too much moisture will make the dough or sheets sticky and hard to manage. When thawing, do not remove the phyllo (fillo) from the package, place it in the fridge 12-14 hours before using. Place phyllo sheets in between two clean and slightly damp paper towels. This will keep them from tearing too much as you are working to assemble spanakopita. 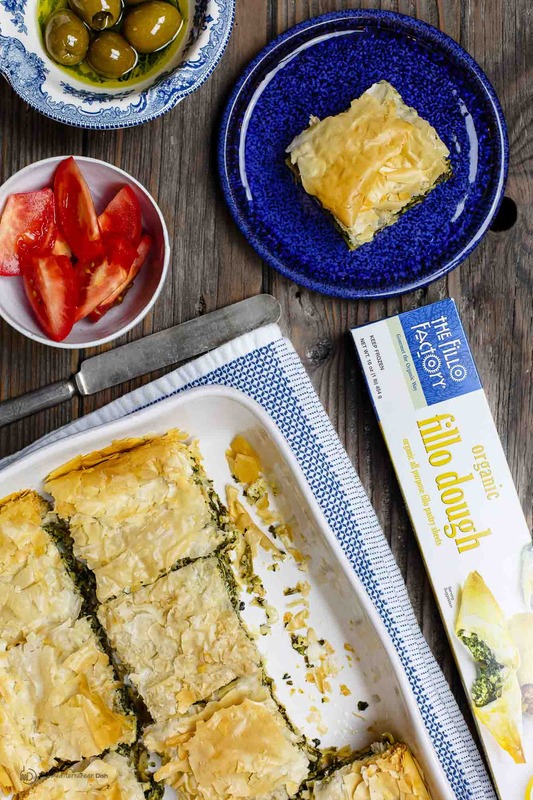 -Before you begin assembling the spanakopita casserole, unroll the thawed phyllo (fillo) sheets and place them carefully between two ever-so-slightly damp kitchen cloths. This helps the sheets remain lenient so they won’t tear too much. 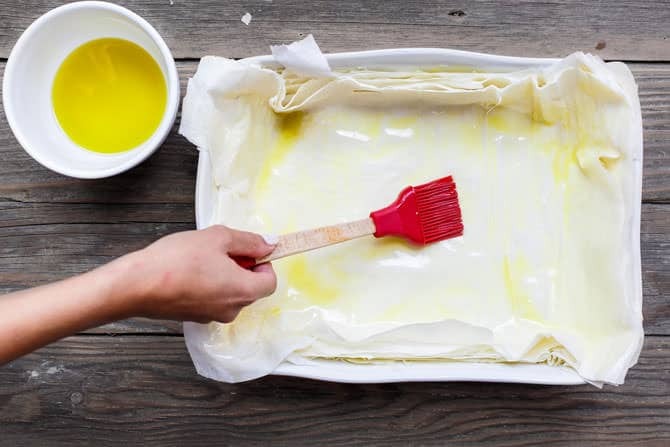 Brush each layer of phyllo with extra virgin olive oil. This photo is about 1/2 way through the phyllo package. -Remember, Phyllo (fillo) sheets will tear, and that’s perfectly fine. Just make sure you save a couple good sheets for the top of your spanakopita casserole. Can I make Spanakopita Ahead of Time? What about Leftovers? 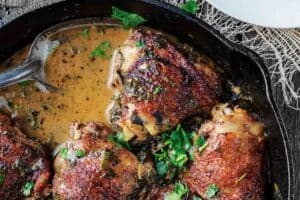 – You can make spanakopita the evening before you need to serve it. Follow the instructions for assembling, but do not bake. Cover tightly and refrigerate overnight. When you are ready, go ahead and bake according to recipe instructions. Budget 1 hour for baking. 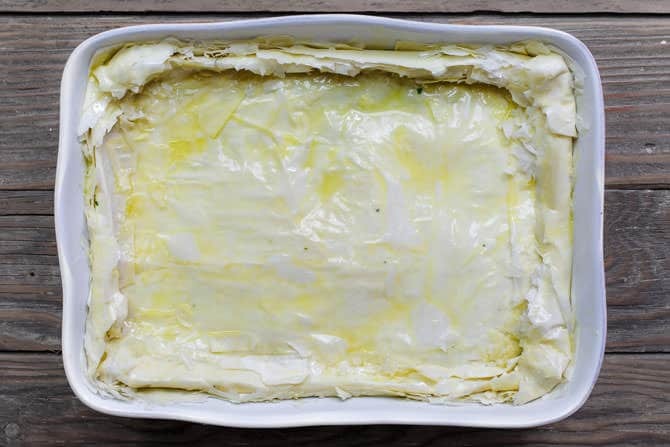 – Already cooked spanakopita will keep well if properly storied in the fridge for 2 to 3 evenings. Heat in medium-heated oven until warmed through. You can also portion cooked leftover spanakopita and freeze for a later time. Warm in oven; no need to thaw in advance. Foolproof family recipe for Spanakopita! Delicious savory Greek pie made of perfectly crispy layers of phyllo dough and a comforting filling of spinach and feta cheese. 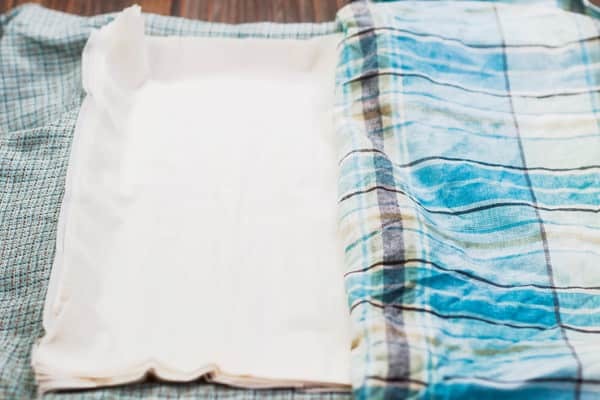 Unroll the phyllo (fillo) sheets and place them between two slightly damp kitchen cloths. Fold the flaps or excess from the sides, you can crumble them a little. Brush the folded sides well with olive oil. Cut Spanakopita ONLY PART-WAY through into squares, or leave the cutting to later. Bake in the 325 degrees F heated-oven for 1 hour, or until the phyllo (fillo) crust is crisp and golden brown. Remove from the oven. Finish cutting into squares and serve. Enjoy! Tips for Working with Phyllo: As mentioned earlier in the post, remember that phyllo is paper thin and will break as you are working with it. For best results, place phyllo dough sheets in between two very slightly damp kitchen towels (step #4) before you start working with it (unless you think you will work fast enough that the phyllo will not dry out.) Also, be sure to brush each layer with oil; don’t skimp. Make Ahead Tips: You can make spanakopita the evening before. Follow up to step #9, cover and refrigerate. When you are ready, go ahead and bake according to step #10. Leftover Storing and Freezing Tips: Already cooked spanakopita will keep well if properly storied in the fridge for 2 to 3 evenings. Heat in medium-heated oven until warmed through. You can also portion cooked leftover spanakopita and freeze for a later time. Warm in oven; no need to thaw in advance. What to Serve with Spanakopita? Spanakopita makes a great side dish for large holiday dinners next to lamb or lemon chicken. But it can easily stand alone as the main dish. 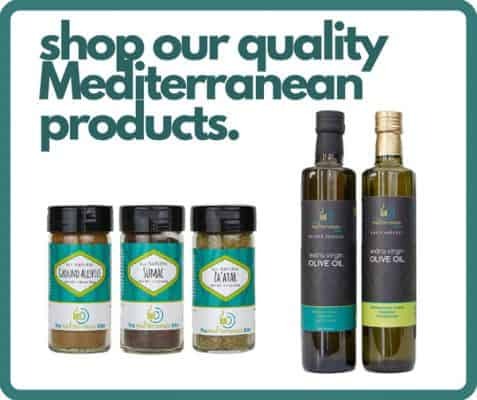 Serve it with a big salad like Greek salad; Balela; or this Mediterranean chickpea salad, and favorite dips like Greek Tzatziki or Roasted Garlic Hummus. *This recipe and tutorial was originally published 11/08/2016. Last updated with new information and photos on 4/15/2019. This was the first time I made spanakopita. It was super easy and delicious! This has become a go to fav for our family. Wow! That’s great, Tina. Thanks so much for sharing this awesome variation! This is an incredible appetizer. Everyone loved it when we made it for our party! This was absolutely amazing!! Everyone loved it! 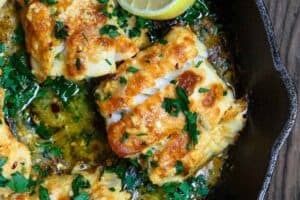 Such a great Mediterranean recipe that never gets old. So GOOD! Such an impressive side dish to add to the Easter menu! It’s sure to be a crowd-pleaser! Love that these simple ingredients make into the super savory dish! Thanks, Sommer! So glad you enjoyed it. This has become one of my favorite foods! Yum! Anything with spinach is just delicious and this is making me hungry. Oh I have to try this! It looks so good. Love spanakopita. I’ve never made one, but seeing your recipe I think I will make it someday, doesn’t look so complicated. It really isn’t! I can’t wait to hear!